A long, rectangular square, a staircase with a white Pope who greets those who pass under his view. And then two ancient fountains, a palace from the 1400, a Church full of treasures of art, a museum and so many cocktail bars, pubs and cafés. Here it is Pope’s Square. It was built in the fifteenth century and since then it has changed many names. New Square at the beginning, then in 1700 renamed Napoleon Square from the French. In 1870 it was called Plebiscite Square to remember the event that marked the accession of the Marche to the Kingdom of Italy. This so beautiful and so special square is known and called by all Pope’s Square as it is dominated by the large marble statue of Pope Clement XII. The statue was built in the 1730s and it was intended as an homage to the Pope who made Ancona beautiful and rich. Clement XII engaged Luigi Vanvitelli, the same renowned architect of the Royal Palace in Caserta. Under the Pope there are two ancient fountains: the Fountain Square and the Fountain of Decapitated. The bas-reliefs of the latter seems to tell the story of the young martyrs who fought for the freedom of Ancona, lost after the coup of Clement VII. Behind the figure of Pope Clement XII stands the San Domenico Church. If you cross the wooden entrance you’ll discover many baroque statues and two masterpieces of great value: the Annunciation by Guercino and the Crucifixion by Titian. Right outside the church, over the head of the Pope, you will see an old building which has a tower with a clock. It is the Government House with the Tower Square. 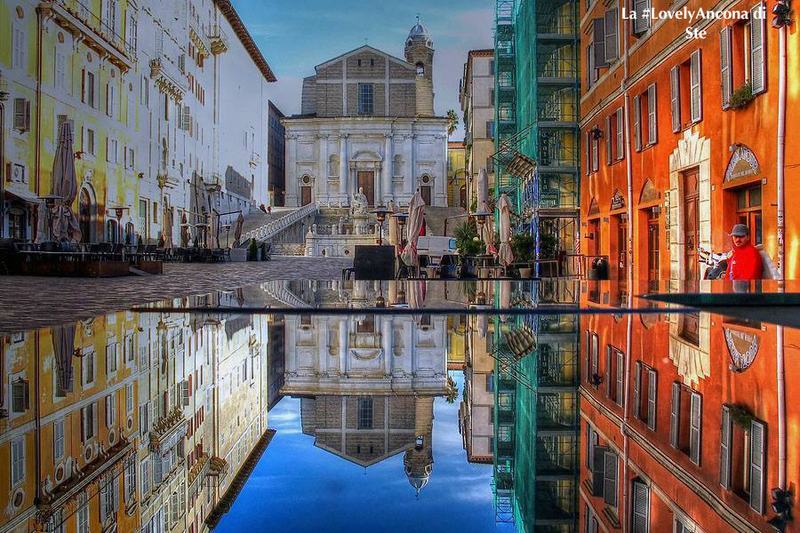 In 1484 this building was the seat of the Republic of Ancona and then it became the Palace of the Prefecture. To your left, always watching the Pope there is the entrance to the Museum of the City. This square at sunset is full of glasses of wine, fresh beers, cocktails and tapas. Stay here for an aperitif, you will not regret. While you sit and order your favourite drink, try to imagine ladies and peasants who came right here, where you are now, to choose the most fragrant fruits and vegetables; it was 1800 and in Pope’s Square there was the vegetable market.